There is no better way to ruin an awesome powder day than with frozen hands. Rather than basking in glorious face shots, you’ll spend the entire day removing your gloves every time you get on the chairlift just to rub your hands together to keep them warm. If you’re participating in other snow-related activities — like snowshoeing or cross-country skiing — it’s no better; when your hands are cold, you can’t focus on anything else. So, if you’re someone who plays outside in the snow a lot, it’s essential for you to own a pair of top-of-the-line, oven-warm gloves. We’ve rounded up six of the best ski gloves with the most deluxe technology to ensure you’ll keep your paws warm while shredding the slopes. Dakine’s Team Phantom glove is a brand-new, warm and cushy, super comfortable glove which — aside from its stellar tech features — is super stylish. The glove is made with drum-dyed goat hides tumbled with Durable Water Repellent (DWR) during the dying process to make the material water-wicking and durable. Inside, 70g Primaloft insulation packs the back of the hand and 200g high pile fleece round out the lining. With a moto-styled, all-leather architecture and a slim fit design, your hands will stay cozy without much extra bulk. The wrap-up finger construction and out-seamed palm make the glove robust with a wrist zipper closure to add to its snug feel. It comes with a removable Gore-Tex insert that’s fully waterproof and breathable so your hands won’t get sticky when you’re huffing and puffing over long traverses. If you’re someone whose fingers are constantly cold and you need gloves that not only block the elements but heat your hands, Seirus’s Heat Touch Inferno is an excellent choice. These are one of the absolute warmest, most high-tech gloves on the market. On top of 150g Primaloft with 100g HeatLock hollow-core insulation and the company’s DryHand windproof liners, the full-grain leather glove has a self-heating panel you can turn on with a button. Seirus outfit its gloves with three settings — depending on how cold your fingers are — which range from two to six hours of battery life. The lower of a heat setting you use, the more time you can squeeze out of the battery. Best of all, the Flexible Fusion panel heats the entire glove, not just the hand area, extending warmth from your thumbs down to your pinky finger. Burton’s Gore-Tex Guide is brimming with industry-smashing technology that all but guarantees your hands and fingers are going to stay warm, dry, and comfy all day long. First of all, the glove’s military-grade PrimaLoft Gold Eco offers extremely soft, packable insulation that’s earth-friendly while also squishing compactly into your pockets. It features a breathable, moisture-wicking brushed microfiber lining on the palm and sherpa fleece on the back of the hand to maximize warmth. The glove is pliable and easy to move your fingers in due to its ergonomic, pre-curved fit. Lastly, the thumb and index finger feature Burton’s patented Screen Grab Gnar Guard leather so you can send texts and snap photos from first chair until apres. Similar to Seirus’s Inferno, the Lucent by Outdoor Research is engineered with a cutting-edge self-heating panel — although this one comes in the design of a mitten. Using ALTIHeat technology with a rechargeable battery, simply pressing a button immediately allows you to feel your fingers glow with warmth. Depending on the temperature outside, the mittens feature a low, medium, or high setting capable of being changed on the fly. The mitts also boast EnduraLoft insulation with a durable, grippy palm made from goat leather and slick Gore-Tex inserts. On top of that, Outdoor Research includes Moonlite Pile Fleece lining, making these an exceptionally warm glove that lets you take turns all day without feeling even the slightest bit of cold. The mitten is also available in glove form. This new glove from 686 is chock-full of killer heating technology, however, the best part may be the price tag. For $55, you get a high-tech, premium snow glove with soft Gore-Tex inserts and waterproof, DWR-treated softshell fabric at a low price. The cozy glove has flexible Ladder Stretch material and both the palm of the glove and the fingertips are equipped with 686’s patented Hex Grip material, allowing you to grab a shovel or ratchet down your bindings with a solid grip. They also boast SoundTouch technology so you can use your phone or take pow-covered selfies without removing them. Gore-Warm technology paired with Light Fill insulation ensures the gloves are toasty warm on even the iciest, most arctic days. Extra bells and whistles include an elastic cord cinch at the wrists, a Velvex face wipe, and a handy leash so you won’t lose them when adjusting your gear on a chairlift. Another mitten option at a reasonable price is Black Diamond’s Mercury. This mitt features ultra warm PrimaLoft Gold insulation and an awesome, four-way stretch Pertex Shield membrane that blasts away the elements while remaining durable and abrasion-resistant. The goat leather palm features kevlar stitching that not only makes it warm but sturdy and long-lasting, as well. If you’re on a hill where temperatures and conditions vary, it has a conveniently removable split-finger liner with high-loft fleece and 340g PrimaLoft Gold — perfect in mid-winter when the blizzards are dumping and removable once the slushy spring comes around. 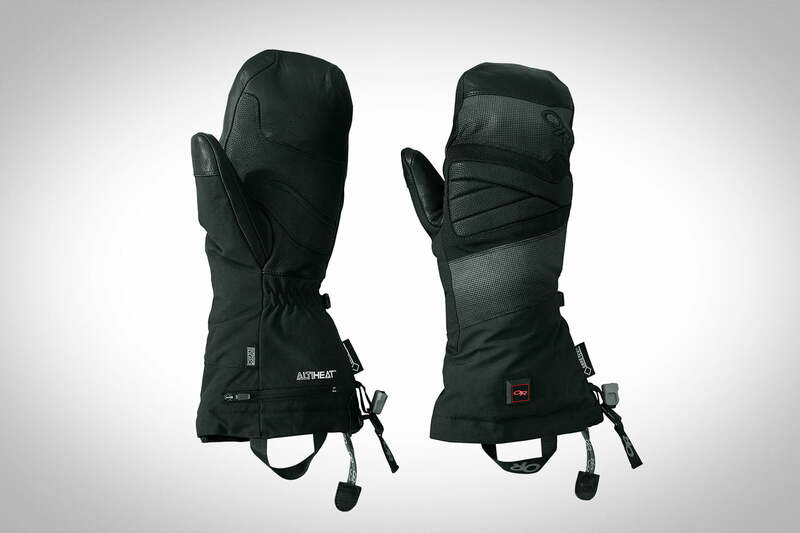 The Mercury is fantastic all-around mitt to use from the beginning of winter through the last day on the slopes.